Help screens: remove the 'p', add an 'l'. You will recall that I've already been through this once. After many, many iterations, I was satisfied with the offensive and defensive help screens. They were attractive, had an effective layout, and didn't overwhelm the user with information. Something that DQ XAML Advisor Scott Ray had said kept tumbling around in my mind. He said that the "ninja" approach would be to create a dynamic help system. At the time (three months ago), the prospect of even designing something like that overwhelmed me. It kept bothering me, though, and I couldn't explain why until I went to a gas station. When you buy gas--at least nowadays--you read a little LCD screen for instructions. And those instructions are given to you as you need to perform actions--"just in time", in manufacturing/inventory-speak. If you think about it, almost anything of a transactional nature includes assistance to prepare you for the next step in the transaction. That's when I realized what was bothering me: games, too, are transactional. No ATM machine is going to have the help for every possible transaction pasted on the front of the machine. They can't, because most people won't even read the (at the time) non-essential information. Then, when they do need that information, they can't remember it. Ah, crap. I realized then that I had to have a "transaction-based" help system. Shoot me. It was particularly painful to work on this, because I had been so relieved when the original help system had been completed. It's very grindy, not fun at all work, and now I had to go through it again, this time doing something that was quite a bit more complex than the original approach. It took the entire week, but it's working now. And clearly, it's much more user-friendly. For instance, instead of finding out about field goals and punts the first time you play offense, as part of a screen with multiple bits of information (the rest of them not about kicking), you see the help the first time the respective kicking buttons appear. It will be much easier to remember, because it's presented at the right time. Plus, I created a "custom" deal of cards for a new user on their first play of offense and defense. It guarantees that a match will be available, and because of that, I can guide a new player throught the matching process and use of the Big Play button. After that play, I go back to the standard deck shuffle as usual. The old help screens--with the charming look but data-dump approach-- are still going to be available from the Options menu. But the new system is much, much easier for a new player. 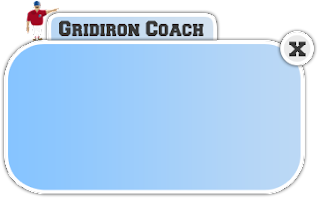 He came up with the "Gridiron Coach" concept, which I thought was terrific. So these little information boxes pop up the first time you need to do something in the game. That doesn't sound like it should have taken a week, but it did. Now that that's done, almost everything I'm doing now will be polish to existing features, with one exception. I'm considering one substantial change to gameplay. You guys have seen the game screens with the cards in the field layout. It's not a conventional solitaire layout in that you can't "see" the next card in the stack. That's because there isn't a stack-- any card you play just gets replaced by the next card in the deck. So there are no stacks of cards. Because of that, there really isn't a lot of strategy while you're playing cards. The new wildcard helps with this, as it clearly adds a strategic element, but largely, the strategy in the game is football strategy, not card strategy. Now, though, with substantially more experience in whatever the hell all of this is, I'm wondering if I could somehow accommodate the people who want more card strategy. I couldn't even begin to imagine how to do that a year ago, in a programming sense, but I can now. Here's the idea, and again, I haven't come close to deciding whether I'll actually do this. The basic concept, though, is that there would be one card showing behind each card on the playing field. A "peek", if you will. When you made a valid play of two cards, the peeked card would then become the newly playable card on each of the two stacks. Then, new peek cards for those stacks would be dealt from the deck. That would add quite a bit more strategy without affecting the basic game mechanics. I don't want people dragging cards from one stack to the other, because I've always had tablets in mind as an eventual destination for the game, and tapping is much easier. Seriously, that last sentence was utterly ridiculous. Before I could even program, I wanted the game to multi-platform friendly. There was zero reason to believe I would ever wind up with a game or anything like it, but I was already digging through the detail ditch. Insanity. What I can't answer about this gameplay change is how badly this would screw up game balance (quite a lot, I'm guessing). So I'm going to work on making a decision, and next week I'll let you know.